On July 4, 2011, I had lunch with my friend Rebecca. It was a welcome diversion because I was on Day 3 of a long holiday weekend feeling bored and borderline miserable. My growing belly was almost too much to bear, and I had been spending the last few weeks working from home to spare me the waddle from my car to the office and back each day. I was getting tired of only myself for company. As we said our goodbyes after lunch Rebecca said, “I bet the next time I see you, you’ll be a mom!” I blew off her prediction, reminding her that I still had about five weeks to go. My due date wasn’t until August 9. I returned home, did a few chores, watched several more hours of Netflix and went to bed. At 1 a.m. my water broke. At 2 a.m. the contractions started. I flipped through two or three pregnancy resource books to see if it would be okay to wait at home a few hours before going to the hospital. I didn’t want to call my friend Sarah, who was serving as my birth coach in Kakasii’s absence*, in the middle of the night. So I waited until about 5 a.m. to call her and she came over about 7 a.m. We started timing contractions. The contractions really weren’t too bad so I didn’t feel an urgency to go to the hospital just yet. Besides, I knew as soon as I got there I would be tied down with monitors and I had found the best way to work through a contraction was to stand and sway. At 10 a.m., since I was still just hanging around at home, I called in to a conference call at work, much to the surprise of my colleagues on the other end of the line. But better to be busy than just sit around waiting for the next contraction. By about noon, Sarah and I headed to the hospital, but not until after my OB’s receptionist scolded me for waiting so long after my water broke. I was grateful for my doula Bobbi who assured me that I had done nothing wrong to wait. Once in triage at the hospital, the nurse strapped me down with monitors. That got really boring really fast so I passed the time checking my email. My OB, Dr. Hoffman, shares a practice with a few other OBs. They rotate through hospital duty so whichever OB is on duty the day you go into labor, that’s the OB who delivers your baby. That was working out perfectly for me because Dr. Nichelson, the OB who was supposed to be on duty that day, had just had twins herself a few months earlier and she had a breech extraction–which is what Dr. Hoffman predicted would probably be necessary for me. The only problem was, Dr. Nichelson was on vacation. So another OB who was not part of Dr. Hoffman’s practice was covering. This OB was known to be very conservative about twin deliveries and would likely push me to deliver by C-section–something both Dr. Hoffman and I wanted to avoid. After all, I was going to be going home to a three-story house with two newborns to care for by myself–not a very good scenario for someone recovering from a C-section. Bobbi got on the phone with Dr. Hoffman. She told Bobbi that I should refuse the C-section if I didn’t think it was necessary. I was really unsure what to do–go with the advice of the doctor who was there, or the doctor who was on the phone. Shortly after 4 p.m. Dr. Hoffman came into my room. “I’ve been working for five days straight,” she told me. “If you don’t have these babies soon, I’m not going to be able to deliver them.” She left to change into her scrubs. I didn’t know what that meant. My friend Sarah looked at me all teary-eyed and said, “You’re gonna have your babies, Brenda!” I got teary-eyed too. They rolled me in to the OR (at my hospital, the policy was all twin delivers had to happen in an OR in case an emergency C-section was necessary) and got me all set up for the delivery. I started to push. Once. Twice. Three times. And there was Max! But just as Dr. Hoffman had predicted, with all the extra room in the womb now, Elly flopped over and was breech. Without hesitation Dr. Hoffman started the breech extraction. Don’t know what that is? Well, she shoved her arm inside me up to her elbow and looked for a place on Elly to grab on to. All she could get a hold of was Elly’s ankle so she pulled her out by her foot. Thank goodness Dr. Hoffman had earlier described to me this procedure and the real possibility that it would be necessary so that I made the decision to have an epidural! Following his quick exit, Max was doing great. He got to move right into my room with me. Elly, not so much. I got to see her briefly but then she got hauled off to the NICU–where she would end up staying for 9 days. Max got to go home with me after two days and then together we went to visit Elly in the NICU every day until she was released. *By the way, if you’re curious about why Kakasii was not present for our babies’ birth, it’s because he was not able to get a visitor’s visa to come to the U.S. So he was actually on safari and outside of cell phone range the day Max and Elly were born. They were 24 hours old before he knew that his babies had arrived. This entry was posted in Family Time, Photography, Twin Fun and tagged birth story, doula, pregnancy, twin birth. Bookmark the permalink. Thank you for sharing the Birth Day story. Happy Birthday to Max and Elly. 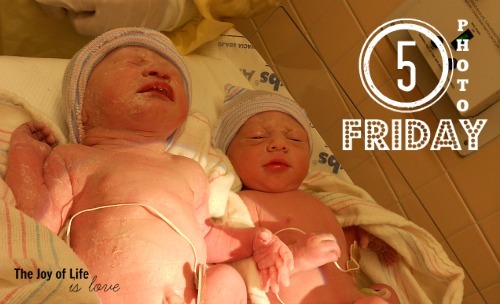 Happy Birthday to Max and Elly and thanks for sharing their birth story.